Lift the lid off this vintage-look Red Breadbox Gift and you'll uncover a selection of five different varieties of Wolferman's English muffins representing our classic traditional, super-thick signature size, and delightful mini. 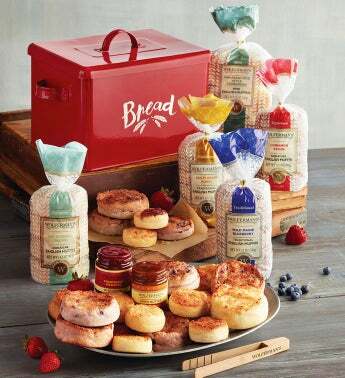 When the wonderful baked goods are gone, the red breadbox tin will adorn the kitchen counter as it keeps bread and other essentials in easy reach. Handle the toasted items safely with the included bamboo tongs.